Having written a bit about body snatchers, or ‘Resurrection Men’ as they were also known back in the 19th Century, I began looking into all the different lengths people went to in order to prevent their deceased nearest and dearest ending up sliced and diced on the anatomist’s slab. A few years ago, my husband treated me to a trip to Edinburgh (sometimes referred to as my ‘mega ghost busting weekend’… oh, the Edinburgh Vaults – happy days…). On one of the ghost tours I dragged him on, we ended up in Greyfriars Churchyard. Our tour guide, a giant Valkyrie of a woman in Doc Martens and with a magnificent booming voice, pointed some curious coffin-shaped iron cages out to us. “These are called mortsafes!” she bellowed at us while we huddled together in the dark graveyard, shivering with cold but intrigued by the strange items highlighted by a dozen quivering torch beams. “When your loved one died, these cages would be placed over the coffin to prevent body snatchers from stealing the corpse and selling it to anatomists!” A little shudder ran through the crowd accompanied by a few nervous smiles. Apparently, in Scotland, mortsafes have been commonly found in areas where there are medical schools nearby… funny that. Mortsafes came in various designs, some made of stone, others made of iron comprising iron rods, padlocks and iron plates, all of which went towards making stealing bodies a very arduous task indeed. 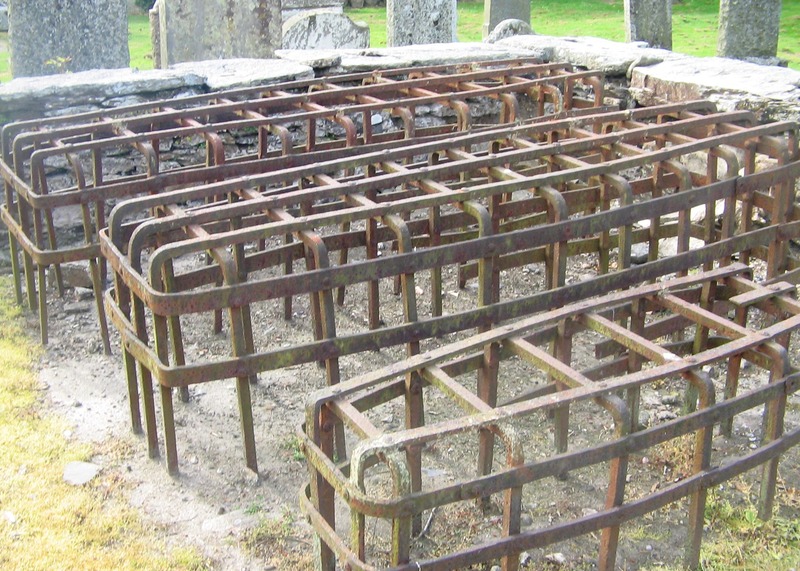 Mortsafes were usually removed once the body was sufficiently decomposed. Of course, if your pockets weren’t deep enough to afford a cage to lock up your dead, there were other options open to you. It wasn’t unusual for fresh graves to be guarded day and night by friends and family members until enough time had passed for the corpse to go off and be of no use to grave robbers or anatomists. The rich went in for huge slab grave stones which covered the graves over entirely, vaults and mausoleums, making life rather difficult for grave robbers. Highgate Cemetery has a vast array of such Victorian monstrosities and Friends of Highgate Cemetery offer guided tours of the older cemetery, if, like myself, you’re morbidly curious and want to see what it’s like to be dead rich. Some families tried mixing various items such as branches into the grave dirt to make the grave robber’s life more difficult, or they would cover the grave with stones so they could see if it had been disturbed. Unfortunately, by the time they realised the grave had been disturbed it was probably empty too. If you want to see how the professionals went about their business, I Sell The Dead is the film for you. It’s a darkly humorous movie and involves undead things too – perfect. What lurks behind closed doors? Urban legends are great fun, but it’s a shame that many of them are just that – legends. A friend told me about a tale he’d heard regarding a mental hospital in Portreath, Cornwall. He said that during renovations of the property a hidden room had been discovered. Creepy. As the builders peered into the hole in the wall they’d made, they discovered a group of skeletons sitting on chairs (what, really?). The rumour was that they were victims of the plague that had been bricked up. I couldn’t find any further information on this so I’m pretty sure it’s just a myth, but it’s an interesting one all the same and it got me thinking about other stories I’d heard about people being walled up alive and hidden rooms. Perhaps one of the most famous hidden rooms is the one in Glamis Castle, Scotland. Apparently towels were once hung from every window in the castle but one window remained without, suggesting that there was a secret room. So what did the room contain? There are various stories, one being of a horrifically malformed child born to the eleventh Earl who was hidden away in the room to prevent people finding out about the tragedy. Another story is that the family walled their enemies up in the room. At least you would always know where to find them. Chillingham Castle has more than its fair share of ghosts, including the spirit of a little boy who was walled up in the castle’s ‘Pink Room’ during the time of the Spanish Armada. The little lad is alleged to have suffered immurement along with some important documents he had been given to deliver to the Spanish. His remains were discovered in the 1920s. Some of the documents sealed up with the child can still be seen on display at the castle. Nuns always seemed to cop the worst punishments in days gone by. So much as wink at Brother Bob and you’re being whipped with stinging nettles and threatened with more Hail Marys than you can shake a stick at. Borley Rectory, perhaps one of the most famous haunted houses ever, boasts the ghost of a young novice nun who was discovered having an affair with a Borley monk (I’m afraid I can’t confirm or deny if his name actually was Bob, sorry). The monk was put to death and the nun was walled up alive in the vaults below her priory. It would seem that her ghost managed to escape the vaults and has been seen wandering around the Rectory, as has the ghost of the monk. I wonder if they ever manage to meet up to carry on where they left off. Being virginal and virtuous used to be a pretty hazardous way of life. In Rome, if a Vestal Virgin was found guilty of breaking her vow of celibacy, she could be buried alive in a small cave with nothing but a small piece of bread and a drop of water to live on. Hey, come on, it takes two to tango. Why not bury the man, too? At least they can go out with a bang. Many thanks for that update!